This website is built around a simple mathematical model of natural (whole) numbers producing a geometry. 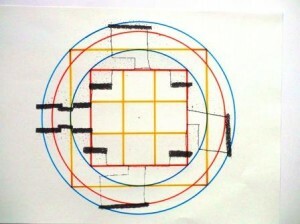 It emerged for me from a 9-number system I had developed to penetrate the prime-numbers, but it turned out to be the exact mathematics expressed in the design of the Great Pyramid and its conceptual prototype, the Third Pyramid and, more enigmaticly, it also applied to the megalithic works in Orkney. Giza is treated here as one great mathematical design, probably created by the later deified Pharao Sneferu, who may have been a mathematician himself and had inspired his lineage with mathematics so much that they one after the other (except the short-lived Djedefre) carried out his masterplan to be preserved for posterity. That is the real greatness of Sneferu and Giza, for us. By any means Sneferu was the first and the greatest builder of ‘mathematical’ pyramids and may have taken a life-long inspiration from the healer and genius Imhotep, the architect and builder of Saqqara, he must have known in his youth. At the end of his life he reconstructed Meidum and set the ground ratios for the later Great and Third Pyramids. Meidum was his signature under the plan of Giza. (Meidum in Royal Cubits of 0.5236m: 275RC = 143.99m , 175RC = 91.63m ; 275 : 175 = 11 : 7 ; Great Pyramid = 440 : 280 = 11 : 7 ; Third Pyramid = 198 : 126 = 11 : 7). Whatever else Giza embodies it surely states in stone two crucial mathematical theorems one of which is the Pythagorean ratio 3:4:5 solidified in the Second Pyramid (Khafre), the other is the intricate integration of the 11:7 and 10:9 ratios, eternalized in the Great Pyramid (Khufu) which produces 22/7 for Pi and even the ratio of the divine proportion 1.618 : 1 (very close: 1.61859- 1.618033=0.0005560), but also the crucial ratios relating to sphere and torus in resonance. Last but not least the Third Pyramid (Menkaure) embodies the geometry of square root 2 and is the theoretical basis and prototype of the Great Pyramid. As if my findings in Giza (inspired by the work of John Legon) were not enough I came across other evidence of these mathematics in Orkney, which is where it really starts to get ‘unbelievable’. I can’t help it. The only thing I do here is organize solid data into a comprehensible whole, the scientific code demands that when a theory is proven consistent with the facts it must be qualified a serious theory, that is, a source of scientific knowledge, like the relativity theory, which is also not necessarily absolutely true. 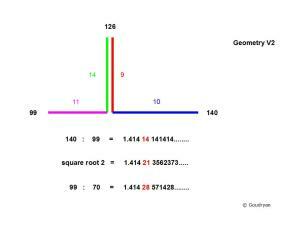 So this is the quintessence of this website: to show that the Pythagoras ratio had intricate and intriguing twin sisters (7 : 11 : 14 and 9 : 10 : 11) who vanished into oblivion and then to bring them back in the light of day to reinstate in mathematics a long lost theorem which embodies the logic of resonance, of numbers and of beauty. To be convincing for the reader I do all I can to use the best data I can find, which is not always easy in archaeology and to show that my data are solid and sound and among the best around. The reason I wrote this piece is that I came across crucial data which vindicate the unit values I use up to the hundredths, which strengthens my case. In this analysis several enigmas emerge which cry out for a comment, an interpretation, so that is what I also do. If we take the natural standard of one day divided by 10^5, the pendulum would be 29.157 inches (7405…cm) at latitude 30 degrees. Now this is exactly the basis of Egyptian land measures, most precisely known through the diagonal of that squared, being the Egyptian double cubit. The value for this cubit is 20.617 inches (0.5236…cm), while the best examples in stone are 20.620±0.005inches. It may seem trivial to bicker about hundredths of millimiters but it can make the difference between obvious fits and continuing misfits, it is also typical of metrology. This site is about whole numbers, all the way, because that is what everything originally was based on, that is the only way to make ratios speak to us, it is the very beginning of using numbers, so how could it be anything else but whole numbers to begin with. Their understanding of mathematics is in my view hidden in their architectural logic. It cannot be denied, because it is everywhere, but sheer disbelief is habitually strong in these matters. Maeshowe in Orkney, probably slightly earlier than Giza, is another treasure trove of circles, squares and triangles but you can’t see it, you need a key and that key is in the ratios of the dimensions which lead to an immediate understanding of the design in a picture. These huge works were built according to plan, according to design, and like all other buildings all over the world some things went a bit different than hoped for and not everything is exactly as planned. You cannot therefore dismiss an intended design because the execution is not absolutely perfect. We are interested in their intentions not in the perfection of their skills, they were human beings, let me stress that in this context, but they were building on a rather ‘superhuman’ scale, so when a convincing logic can be found in their ratios there is no reason to minimize this finding as ‘one of those things’. Because, if what I have found is anything, it is of major importance. Up to now the debate has centered on the astronomy of the Neolithic, but nobody (as far as I know) has addressed the question of how they went about counting and recording their data and by what means. In my work I focus on something which must have accompanied it, that is: mathematics. You cannot make a calendar without counting and finding numerical cycles. So one of the themes of this site is how they counted. The obvious cycle of the Moon is very visible and predictable in the short term, its cult is related to fertility, but when it comes to the Sun counting over a longer term is inevitable and probably birth and possibly rebirth were central themes. This ‘turn to the Sun’ for, most probably, agricultural reasons is accompanied by a Sun-cult which finds its most emblematic expression in the standing stone, which casts a moving shadow of the sun. I define a Sun-cult with erecting standing stones and building with mega-stones as a Megalithicum and thus there were an Atlantic and Mediterranean Megalithicum, among others elsewhere in different ages. The obelisks of Egypt’s Heliopolis (helios=sun) and its Sun-cult (Ra or Re) are wellknown, they are sophisticated signs of the Mediterranean Megalithicum, they have as counterparts the slightly earlier giant standing stones of the Atlantic littoral, like the 20m megalith Grand Menhir Brise in Brittany (France), which was probably felled by lightning but originally functioned as a sundial, expressing the primordial link between the sun and day-time. This Sun-cult which became embedded in a scientific cosmology was the source of the collective Begeisterung (enthousiasm) which must have accompanied the hard labor involved in the incorporation of their knowledge in the proportions of their works (Carnac?). Huge places like Maeshowe, Stenness, Brodgar, Avebury and Stonehenge are what they are because of the information they had to embody. The identification of the stone with the Sun is an illustration of the insight that the stone, as stardust, is of the same nature as the Sun (as we are). So we do well to examine the character of a ‘scientific’ Sun-cult in the Atlantic Megalithicum rather than a cult of the dead, as the archaeologists have it. I am convinced that one of the most revolutionary things of the Neolithic is the organisation of people in (semi-) permanent collectives engaging in collective works. This collective work and what it enabled people to create together was one of the great social innovations of the Neolithic and it may have been in a spirit of ‘religious fervor’ that these incredible monuments of collective effort were realized. It is highly relevant today to wonder whether the internet can create a collective consciousness and organised actions on a global scale that can change society forever. What we see today may be the beginning of a global ‘cultural information revolution’ similar to the spread of agriculture, which was also increasingly based on collective knowledge. Another fact came to my attention which has a similar bearing on this site although it may seem totally foreign here; it though serves to show how important the ‘hundredths’ are when it comes to relations to other standards of measurement as we see it in metrology. 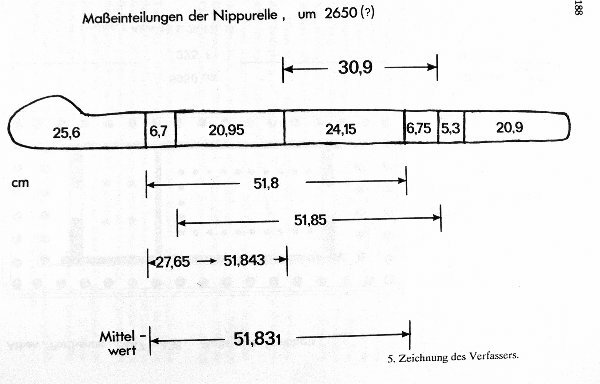 The Nippur Cubit, which is an ancient Sumerian measurement unit, is another strong confirmation for the ratios which embody my model and the importance of exactness even though we inevitably deal with a ‘cloud of values’ for each unit. It is in the sketches by the finder of the original yardstick that we find the basis of the generally used values. I was never quite sure whether I used the right value, either putting it at 51.84 or 51.835 depending on the occasion, but many use 51.85 which troubled me, so below the reader can see the possibilities and that my values are ‘correct’. We see here 4 values found by examination being a 51.80 to a 51.85 and in between a number 51.843 which I do not directly understand and the average (Mittelwert) of 51.831, which means my values are completely acceptable and at the same time perfectly fitting my metrological framework. Point here is that from my system it emerges that the Nippur Cubit (German: Nippur-elle!) relates to the Egyptian Royal Cubit as 99 : 100. Since 52.36 /100 x 99 = 51.8364, this number perfectly fits the central margins of the original yardstick we saw above and can be rounded off as 51.835. As far as I know from internet nobody has ever suggested this ratio of 99:100,( usually it is 24:25, I think, but that cannot be right, given the above measurements), so that a new ratio, the 99:100, is quite something in a field as metrology and the Pyramids, where absolutely every possible corner has been tried on ratios of units and no stone is left unturned for an argument. So possibly again a first here, 99RC = 100 NC. This ratio is more significant than it may seem because suddenly the side of the Third Pyramid, which I deem is 198RC, taken at the pavement level on east side (in order for the diagonal to be 280 RC, which is the height of the Great Pyramid), this very side is equal to 200 Nippur Cubit. Also this has never been noted before simply because of the lack of an adequate interpretative model. (My values derive from a solid theory based on the right premises). 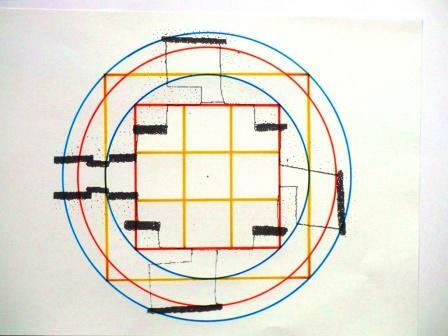 In Menkaure’s dimension of 198RC the Royal Cubit’s 7 partition is asserted as a replacement of the Nippur Cubit as cosmological standard. Sumerian cosmology was the standard of the ancient world before Egypt took the stage with Giza. It is this kind of case where the right theory should be decisive. No one but incurable sceptics doubts Khufu was based on the ratio 11:7 and Pi=22/7 and Khafre on the Pythagorean ratio 3:4:5, but what about Menkaure? There are no convincing explanations for its dimensions or slope other than the ones I give, that is, as key-proto-type of the Great Pyramid. 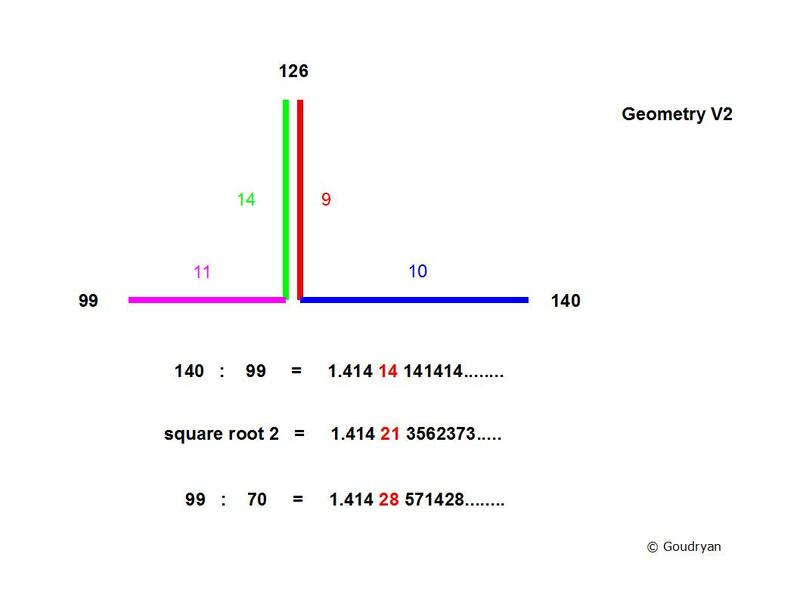 You won’t find any one on internet claiming it is 126RC high, which is the key that fits the 274RC height of Khafre (126+274=400) and is crucial to the ratios 9 : 14 (9×14) and 198:126 (11:7). Some claim it is based on a ratio 200RC : 125RC = 8 : 5, but that ratio has no geometrical meaning, it only looks nice in our decimal-trained eyes. I am convinced my logic can compete with the best in the field because of its simplicity, transparancy and accuracy. In my concept Giza is a truly mathematically integrated whole, with Menkaure the key to the mathematics and logic in dimensions of the Great Pyramid and as preserver of the ‘cosmic length’ of 198RC in its paved east side (= the diameter of the ring of Brodgar, which thus exactly fits in the Third’s mathematical base square), a length which returns in the distance from the floor level (top Gallery) of the King’s Chamber to the top of the Great Pyramid, a crucial place, it also is the width of the Pyramid at the airshaft exit level, 126RC below the top. I put great effort into getting the most solid data to build on because so many ‘bad’ data are around that no argument can be built upon them, or it is misleading. We have to go back to authoritative sources to get the right picture, which means we examine the originals when they are available. 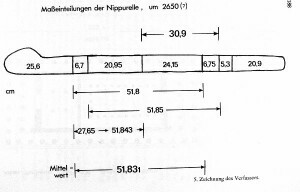 In the sketches above we get an indisputable rough limit of 51.80 to 51.85 for the Nippur Cubit, this is rock solid data, but ambiguous in itself. It though does tell us that their units were not precise in use. Since tenths of mms do count in the ‘mechanics’ of our calculator we have to refine our values in order that we come to an integrated picture, which is amazing enough in its own right as I will show (below), and in fact seems to embody a mystery of deep universal knowledge. That is what this is all about, (re-)constructing and proving the universal calculator, using the same natural number logic in geometry as cultures from antiquity. It may all seem a bit far-fetched, but then, why does it fit? 63 MY = 99 ME/RC = 140 MR/RR = 175 MF/RF = 100 NC = 51.835 m.
Twice this radius gives us the length of 103.67 m = 198 ME/RC. These are the radius and diameter of the ring of Brodgar, so in Brodgar and Third Pyramid all these ancient units of length find expression in ratios of integers. This is the universal calculator and I think it is remarkable that by combining seemingly incompatible cultures in mathematics you can produce a common system in compatible length and measure; it makes one wonder, how come?